Alicia’s Tamales Los Mayas (ATLM) knows that the best tamales are stuffed with love, and that the best people are stuffed with Alicia’s tamales. As a company, ATLM offers the best in tamales and Mexican cuisine, handcrafted with authentic Mexican sazón and uses the freshest and highest quality ingredients available. And, of course, there is the most important touch of all—love. You can currently find ATLM at nearly every major San Francisco festival and event, food and non-food related (Outside Lands, Launch Fest, San Francisco Street Food Festival, SF Beer Week Festival and more). ATLM caters to over 80 companies on a monthly basis through corporate catering partners and provides delicious meals through her private catering. In the next few months you can look forward to having her tamales at your local grocery store! Alicia’s Tamales Los Mayas’ mission is to own a successful sustainable business committed to improving the world around us, providing an experience where customers can enjoy delicious, hand-crafted, homemade tamales made from high quality, local and organic ingredients, and most importantly, love. ATLM’s vision is to own a worldwide recognized brand to create opportunities for families and positively impact the community and the planet. Alicia Villanueva was born in the city of Mazatlan, located in the Northeastern part of the Mexican republic and in the state of Sinaloa. She has been stuffing tamales since she was a kid, with her mami and her abuelita. Alicia began working for her dream as early as 2001, when, arriving in this “beautiful and blessed country” she was impressed to find the many cultures represented in everyday life. Immediately, Alicia thought of tamales as a way to connect her story to those of the people around her, and as a way to potentially make a living for her family. Alicia began selling tamales door to door, lovingly making up to 500 tamales in a single week. But even though it felt like a lot, it was barely enough to cover the bills. Now, Alicia makes over 4,500 tamales a week! At home, Alicia and her husband Pedro, her three children; Pedro Jr., Pablo, and Grecia make tamales for the holidays and special occasions. Making tamales together means spending time with friends and family, sharing stories, and carrying on traditions. When you eat “one of our tamales, we want you to feel like a part of our family.” says Alicia. Alicia has worked hard to get to the point where she can share these tamales with you, and we hope that you taste not only the flavor but also the love in every bite. I am thankful to all those who have supported me from the beginning especially my clients, my family, my production & administrative team, Viridiana Ponce from VP Consulting, Christopher from Copernicus Fund, La Cocina, my kickstarter supporters, Sukhi, my beautiful friends, and to GOD for ALL the blessings, guidance, direction, and helping me in making the right decisions in my life and business. I would love to express my gratitude and my love to my husband Pedro and my 3 children; Peter, Pablo and Grecia. My family has always supported me through thick and thin. Although they have their own responsibilities including school, personal goals, and friends – they are always next to me helping raise my business from a little seed to this beautiful growing tree. As a mom one of the things that frustrates me to no end is sacrificing the time I have with my children.This time is priceless. However it is never too late to fix this. My goal is to grow my business and get to spend more time with my children. 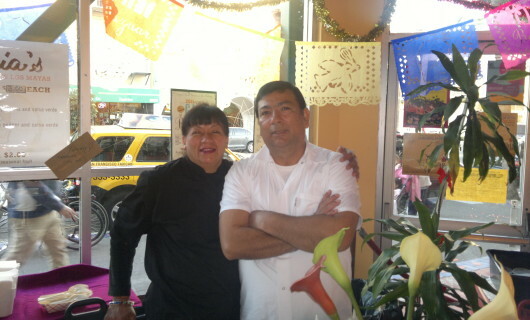 In August of 2010, Alicia Villanueva came to La Cocina with a dream: to start her own tamale cart, as a means to spread her own Mexican traditions and customs. For Alicia, the best tamales are stuffed with love, and the best people are stuffed with her tamales. she’s been making delicious tamales for her family and friends for years, and finally decided that it was time to let the rest of the world in on her amszing food. 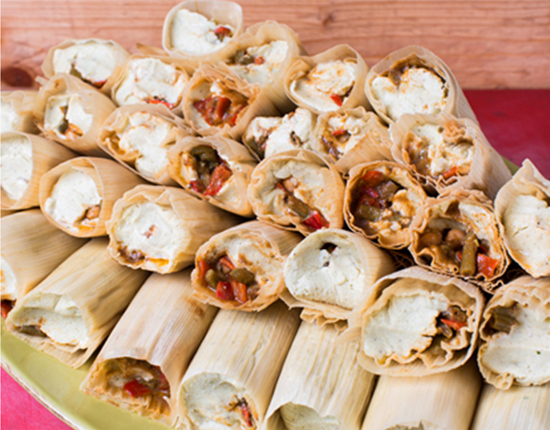 Tamales los Mayas made its debut at the 2010 San Francisco Street Food Festival and Alicia;s spent the months since perfecting her business. Luckily, for San Francisco tamale enthusiasts, ALicia’s tamales Los Mayas launched at Justin Herman Plaza in October 2011. 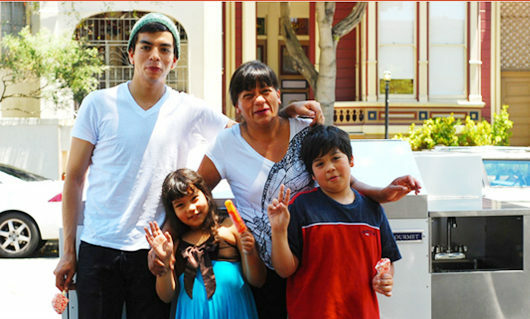 In August of 2010, Alicia Villanueva came to La Cocina, a non-profit incubator kitchen in San Francisco’s Mission District, with a dream: to start her own tamale cart as a way to support her family. With a business plan in mind, and plenty of determination, Alicia launched her sales in the same month at the San Francisco Street Food Festival, selling nearly 1,500 tamales in a single day. Seeing the potential in Alicia’s Tamales Los Mayas, she piloted a tamale cart from Jeff Burker from Metal Gourmet and was able to begin daily sales at Justin Herman Plaza through a program with San Francisco’s Parks and Recs Department. 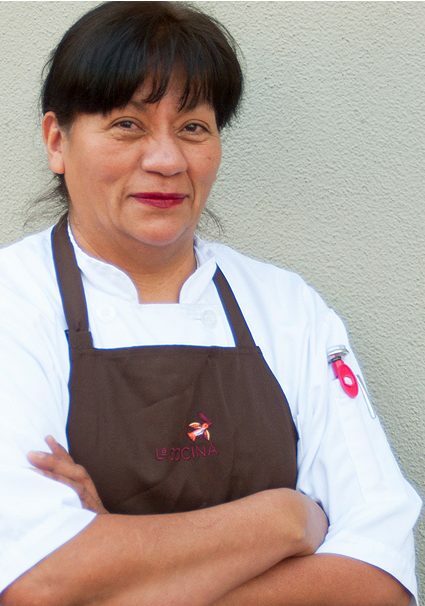 When Alicia thinks about being accepted to La Cocina, sometimes she says that she has to pinch herself. Now, just 5 years later, Alicia has grown her business to move into a 6,000 square feet factory, to scale up to 14 employees and over 24,000 tamales a month. She’s a regular at large-scale events and loves her catering clients. 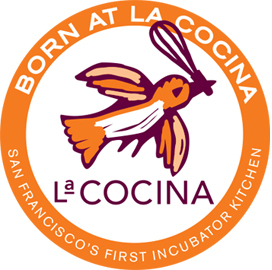 The process at La Cocina and other community nonprofits (MEDA, Opportunity Fund, MAF) in SF, gave her the confidence and resources, to grow her business and to hire people like her who want to make a living for their families. She aspires to be the brand that you go to when you want a taste of home.